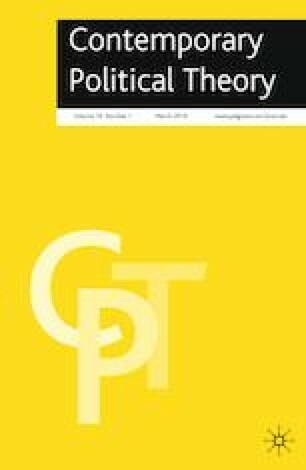 This article seeks to illuminate the figure of the child in democratic politics by arguing that children play a constitutive role as temporary outsiders who present both renewal and risk to the demos. Using Hannah Arendt’s concept of natality, we begin with an ontological account of children as new individuals that are central to renewing democratic freedom and plurality. In the second section, we explore how children can be conceived in terms of political risk by focussing on Arendt’s debate with Ralph Ellison concerning the desegregation of American schools in the 1960s. Their arguments about whether children should appear in politics underscores the constitutive role that child–adult relationships play in debates about the normative fabric of democratic society. Finally, we use the radical democratic theory of Chantal Mouffe to argue that children can be characterised as an excluded group of potential adversaries that appear in political contests over claims to represent the demos. From this perspective, the article reveals that children are central figures in democratic politics because they are constituents of an unknown future polity. We wish to thank the editors of Contemporary Political Theory, especially Michaele L. Ferguson, and two anonymous reviewers for their generous, patient and helpful feedback. We also acknowledge that this research has been funded by the Australian Government through the Australian Research Council Discovery Indigenous funding scheme (IN160100039). The views expressed herein are those of the authors and are not necessarily those of the Australian Government or Australian Research Council.